More than 2.7 million acres of iconic US landscape could be at risk from fossil fuel exploration following Donald Trump’s decision to review protections on national monuments, an Unearthed investigation can reveal. Trump issued an executive order last month requiring the Department of Interior to review 27 monuments designated since 1996 – suggesting they could pose a barrier to energy independence. Unearthed can now reveal that an area of protected land larger than Yellowstone national park could be at risk from drilling as a result – with six national monuments affected by the executive order sitting above known or potential reserves of oil, gas and coal. The order requires Secretary of the Interior Ryan Zinke to recommend whether monuments should be rescinded or resized within 120 days. Explicitly instructing him to consider the impact of the monument’s protections on natural resource development. Last week, Zinke argued that, following energy development, land can be returned “to equal or better quality than it was before extraction”. As part of the review, Zinke toured Utah’s Bears Ears national monument on horseback yesterday and is due to visit the Grand Staircase-Escalante national monument today. Our analysis found that 90% of Bears Ears and 42% of Grand Staircase sit above potential fossil fuel reserves. Unearthed took official US government maps of fossil fuel plays and sedimentary basins and overlaid them with national monument boundaries to identify areas potentially at risk from fossil fuel exploration. In addition to Bears Ears and Grand Staircase, monuments now threatened include Upper Missouri River Breaks in Montana and Carrizo Plain – which is the last remnant of a vast grassland that once stretched across California. Map showing potential fossil fuel reserves below national monuments (in green). Grand Staircase (left); Bears Ears (centre) and Canyons of the Ancients (right). Bears Ears is a giant expanse of red rock, juniper forests and high plateaus that is sacred to many Native American tribes. The monument contains archaeological and cultural sites that are thousands of years old. The site was designated by President Obama in December 2016 – sparking outrage amongst Utah’s congressional delegation at the time. Trump cited the influence of Utah senator Orrin Hatch as the main driver behind the executive order – handing him the pen the order was signed with during the ceremony. According to the Unearthed analysis, 90% of Bears Ears sits above potential oil and gas plays. 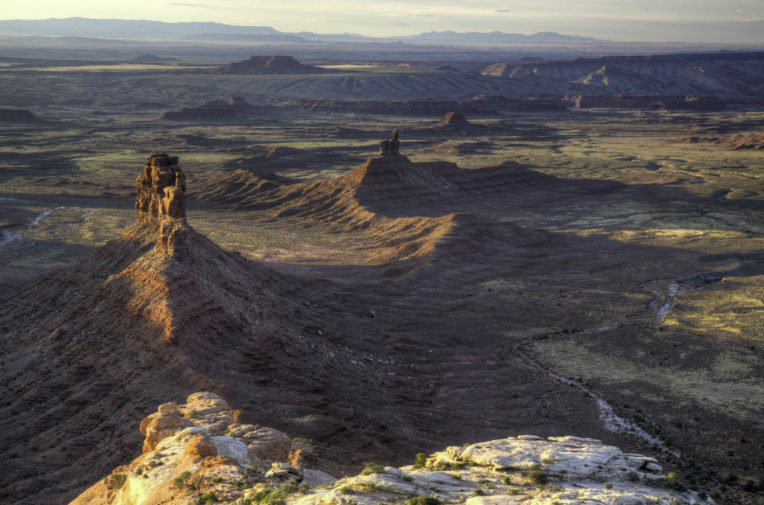 Months before the designation the Utah Division of Oil, Gas and Mining approved drilling applications by EOG Resources – one of the largest independent oil companies in the US – on land that is now within the monument boundaries. EOG has retained its rights to explore and drill in Bears Ears because the designation only restricts new leasing. The Western Energy Alliance – a trade association representing oil and gas interests in the region – has confirmed that industry is interested in gaining access to the monument. Kathleen Sgamma, the group’s president, told E&E News last month that: “There certainly is industry appetite for development there, or else companies wouldn’t have leases in the area”. Trump’s decision to review national monuments designated since 1996, wasn’t taken at random. The first monument on his list is the Grand Staircase-Escalante in Utah – which was created by President Clinton in January 1996. Senator Hatch has been fighting the monument ever since and personally lobbied Trump and Zinke to scrap it. He added: “Bears Ears was Grand Staircase all over again”. Unearthed found that 42% of the land covered by the national monument harbours reserves of coal. And while there is no chance this would be mined any time soon, in February Hatch told Utah’s state legislature that President Trump has assured him: “He would be able legally to create the access to this great treasure that may save Utah and the country someday”. The economic case for rescinding the monument has been questioned by some local businesses. The Escalante Chamber of Commerce wrote to secretary Zinke in February arguing that the monument had resulted in millions of dollars of investment in the local economy. A few hundred miles west of Grand Staircase and Bears Ears are two national monuments in California which could also be threatened by energy development. Carrizo Plain – a remote area of California grassland famous for it’s spectacular springtime wildflowers – was made a national monument by President Clinton in January 2001. According to Unearthed’s analysis, just over a quarter of the 247,000 acre monument sits above basins that the Energy Information Administration suggests could be prospective for fossil fuels. Clinton’s designation allowed for existing oil and gas activity to continue at the site but put a stop to any new licenses being issued. The Bureau of Land Management’s 2010 resource management plan for the monument estimated that there were 45 oil wells within its boundary, including 15 producing wells. The document suggests that recent technological advances “may result in more activity in the future”. There is also significant oil exploration surrounding the monument. The largest oil field in California lies just a few miles to the east. According to the BLM, Carrizo is surrounded by “six giant and upper-giant oil fields (fields with over 100 million and 1 billion barrels of reserves, respectively)”. San Gabriel Mountains – just outside Los Angeles – was designated as a national monument by President Obama in 2014, after years of campaigning by local groups. Unearthed’s analysis shows that the vast majority of the monument sits above a sedimentary basin that is potentially prospective for fossil fuels. And although it is unlikely there would be exploration any time soon – there is evidence to suggest that there could be in future. A 2005 resource management plan for Angeles National Forest – around half of which became the San Gabriel Mountains national monument – states that: “Portions of the national forest have been identified as having a high potential for oil and gas reserves; however, no requests for exploration have been received for exploration in the last ten years”. And there has been oil drilling in the area surrounding the monument in the past. “When President Obama declared the San Gabriel Mountains a national monument, it immediately opened the door to new funding that has increased access to these beautiful mountains, streams, and forests, and improved staffing and safety on the trails”, she said. 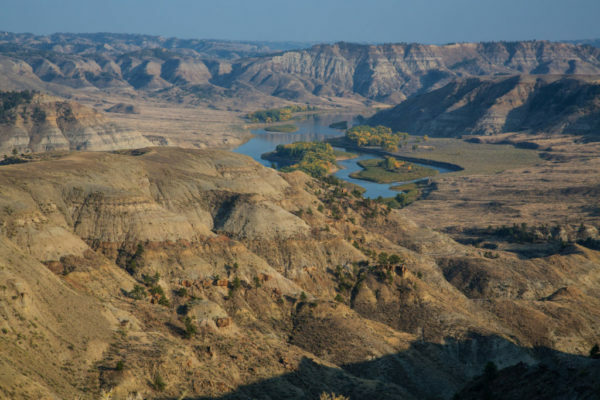 Also under threat is Upper Missouri River Breaks National Monument in Montana – secretary Zinke’s home state – which was created in 2001 by President Bill Clinton. The designation permitted existing oil and gas leases to continue to operate, but prevented new leases being developed. In 2008, the Bureau of Land Management (BLM) published an extensive resource management plan, which included plans for new oil and gas wells. Conservation groups challenged the BLM’s plan, arguing that it risked harming the important natural and archaeological areas of the monument. In 2013 the Ninth Circuit Court of Appeals ruled that the BLM should redraft its plan to better preserve the historic and cultural artefacts at the monument. Joe Offer, stewardship director at Friends of Missouri Breaks Monument urged Montana-native Zinke to resist Trump’s plans. Another monument that has already seen oil and gas drilling take place is Canyons of the Ancients in Colorado. Around 80% of the monument – which is on the border with Utah – is licensed for oil and gas and was designated to protect archaeological sites from further development. Colorado Governor John Hickenlooper said that he has been reassured by secretary Zinke that it is “unlikely” that any Colorado monuments will be subject to review. But this has been denied by Interior which said that no decisions have yet been made. The investigation took official US government maps of oil and gas plays, coal fields, and sedimentary basins and overlaid them with national monument boundaries to identify areas potentially at risk from fossil fuel exploration. Maps of coal fields from the US Geological Survey – from which we excluded those considered “of doubtful value”. Maps of US sedimentary basins (EIA) – which are geological formations that could be prospective but need further exploration. The EIA told us that its oil and gas “play” maps are based on data from drilled wells and are therefore restricted to areas where exploration and production has taken place. EIA officials said that sedimentary basin data would better show the full extent of areas that could be prospective. We supplemented this mapping data with further reporting on current or past exploration activities in and around the monuments.